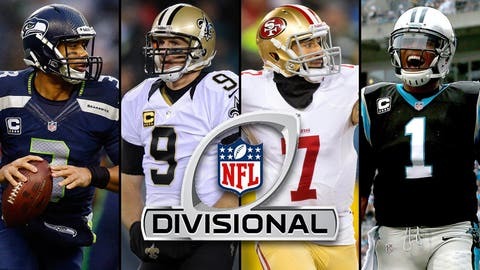 There were nearly some terrific storylines for the divisional round of the playoffs: Peyton Manning vs. Andrew Luck; Danny Woodhead against his old employer, the New England Patriots; the San Francisco 49ers vs. the Seattle Seahawks and the Carolina Panthers in the rubber match against their division rival New Orleans Saints. Put those on ice for a week because we may get to revisit them for the conference championship games. But for now, revenge is the theme of the week. All four of the games coming up next weekend feature teams that aren’t lacking in familiarity with each other. And one team in each game is looking to get back at an opponent for a recent, morale-crushing loss. We’ll start with the most recent and stunning of those defeats. On a cold Thursday night last month, the Chargers played keep-away with Peyton Manning and the Broncos offense, and it worked perfectly in a 27-20 San Diego victory that made the Broncos suddenly seem awfully vulnerable. The Broncos ran only 53 plays that night, which was the fewest they ran all season. The second-fewest (60) came earlier this season in a 28-20 victory over — you guessed it — the Chargers. So both times San Diego has played Denver, Mike McCoy’s offense has tried to slow the game down (a season-high 44 rushing attempts in the second meeting after running it 35 times in the first matchup) to limit Manning’s touches. "The longer you keep the ball and the less he has it, the better off you’re going to be," said McCoy, Manning’s former offensive coordinator, after the Chargers’ upset victory. McCoy knows Manning is a nightmare for a defense when he gets into a rhythm. He surely also knows the cold has caused Manning 2.0 plenty of issues, so when you can ice him for a while, that’s ideal. But we’ve got bad news on that front for McCoy in the form of a weather forecast that’s calling for a high of 50 degrees on Sunday. Oh well, rhythm-breaking it’ll have to be. However, the Broncos know what the Chargers’ game plan will be, so expect them to load up the box and try to get Philip Rivers and his bolo tie to throw it a little more. Rivers averaged 24.5 passing attempts against Denver and 35.3 passes in the 14 other regular-season games. And, of course, it should be noted the Broncos will have Wes Welker back for Sunday’s game after not having him in the loss to San Diego last month. Welker is a chain-mover, so his return should bode well for Manning’s ability to extend drives and prevent the Chargers from playing their game of keep-away. Tight end Jimmy Graham got dressed at his locker and then turned around to face a crowd of media. He was grinning widely. The Saints had just beaten the Eagles in a physical game, outdoors, in a hostile environment, on the road and in the playoffs. Graham admitted he and his teammates had heard all of the chatter about their inability to do such things, yet they did them all in their win over Philly. And now, they’ll have to do them all again in Seattle, where they were trounced 34-7 by the Seahawks last month. Saints coach Sean Payton was encouraged by the physical play of both his offensive and defensive lines on Saturday. It revealed a dimension to this seemingly pass-happy team many weren’t sure they had. But the Eagles allowed it to happen and actually encouraged the Saints to run by playing both of their safeties deep. The Eagles don’t have the front seven to stop a running game that’s clicking without a little help from their defensive backs. But the Seahawks do, and they’ll rely upon a very good group of defensive linemen and linebackers to stop that running game, if the Saints try to go that route again. Doing so would allow them to do something else that was extremely effective last month, and that is to take away the deep ball and force Drew Brees to take check-downs to his backs and shorter options. In the loss to Seattle, Brees had only 147 yards on 38 passes. That’s 3.9 yards per attempt, which is the lowest for Brees in a game since he and Payton joined the Saints in 2006. Following the game, Brees said that performance wasn’t representative of the true Saints offense. Brees also said it appeared the road to the Super Bowl in the NFC would run through Seattle. He was right. And now he and his teammates get another crack at the Seahawks. "Just stepping into that environment on Monday Night Football, we know what to expect. We were there in the playoffs in (January 2011), so we’ve played there in some big atmospheres," said Brees, whose Saints were upset by the Seahawks in that postseason game three years ago. "We were there Sunday Night Football in 2007, so it seems like every time we’re there it’s a prime-time game. Having another crack at them, obviously I look forward to this week of preparation. I look forward to the plan that we’re going to put together. They’re a great football team. This is the one dish of revenge this weekend that’ll be slightly cold. The rematch between Luck and Tom Brady dates back to last season, when the young upstart headed to Foxboro to face the seasoned, accomplished veteran. Brady and the Patriots hammered the Colts that day, 59-24. With three interceptions and a fumble, Luck had one of the worst days of his young career. "It was a lot better than the first day Peyton Manning came up here," then-Colts interim coach Bruce Arians said, referring to Manning’s three-interception performance in his first game in Foxboro. "I was here that day." The Patriots tormented Manning early in his career. Fortunately for him, he has gotten enough shots at Brady to land a few jabs of his own. Luck won’t get that many matchups like this against Brady, and this will be seen as a possible coming-of-age game for him after a tremendous performance Saturday in the Colts’ 28-point comeback victory over the Chiefs. The problem for Luck and the Colts is they continue to have issues with starting slowly. They were a minus-32 in point differential in the first quarter during the regular season. The four teams with a worse first-quarter differential all missed the postseason and had a combined 19 wins. If Luck and the Colts find themselves down four touchdowns to Brady and the Pats, the stories written afterward won’t be of comparisons between Luck and Michael Jordan. Rather, they’ll be along the lines of those written after Luck’s disastrous trip to Gillette Stadium last year. Shortly after Phil Dawson’s game-winning field goal beat the Green Bay Packers on Sunday, Colin Kaepernick might have been thinking about celebrating with his teammates or getting warm, but the one thing on his mind during a postgame interview with FOX Sports was revenge for a 10-9 loss to the Panthers at Candlestick Park in Week 10. "That we owe them," Kaepernick said, "for the first time they came to our house." Usually a terrible quote with the media (when it comes to talking about football, at least), Kaepernick then echoed similar sentiments about getting another crack at the Panthers when he met with reporters at his postgame press conference. The fact he was looser than usual in talking about getting the chance to see the Panthers again was an indication it’s so on between these teams this week. The 49ers are hot, having won seven games in a row. But the Panthers will remember the way they harassed Kaepernick in November, sacked him a career-high six times — the most he’d been sacked before was four — and held him to 16 yards rushing on only four carries. The difference now is Kaepernick has Michael Crabtree at his disposal. Crabtree still isn’t in top form but he’s close enough. In Green Bay on Sunday, he won 1-on-1 matchups on his way to eight catches for 125 yards. That means the Panthers likely won’t be able to focus on Kaepernick the way they did in the regular season because there’s another weapon in the passing game to defend. With the way they’re playing and with Crabtree on the field, the Niners like their chances in this rematch. That was evident in what Kaepernick said on Sunday. Look for it to continue this week with an extremely confident bunch that knows momentum is on their side again. 1.) The talk around the league is that this is the year Bengals defensive coordinator Mike Zimmer will get a head-coaching gig after years and years (and interviews and interviews) of falling short. Zimmer had to wait to interview last week because the Bengals had a first-round game. Their elimination on Sunday means he can now be hired immediately. A source told FOX Sports that Zimmer has received interest from the Detroit Lions, Minnesota Vikings and Washington Redskins and could interview with all three teams this week. 2.) Before the season, the NFL announced players who don’t wear the mandatory leg pads would be removed from the game by officials until they have thigh and knee pads that comply with the regulations for approved padding. Well, the officials either didn’t notice or ignored the fact 49ers running back Frank Gore had no thigh or leg pads in his pants during the final minutes of Sunday’s game. Gore gained 12 yards on the final four plays before Dawson’s field goal, including a 4-yard run to convert a third-and-3. He did it all without pads in his pants. Gore has often been fined for uniform violations because of his pants and socks and might get docked for this violation, as well. But per the rules set forth before the season, he should have been pulled from the game. 3.) Everybody’s favorite officiating piñata Jeff Triplette deserves a lot of credit for the way he and his crew handled the Chargers-Bengals game Sunday. The call on the field and the replay ruling following Bengals tight end Jermaine Gresham’s catch late in the first half were both correct. Triplette then made sure to notify Andy Dalton the clock would be running when the ball was put in play. Triplette and the replay official also made the right call on a fumble ruling on Bengals running back Giovani Bernard by saying he made a football move and then lost the ball. He’s had plenty of shaky moments, but Triplette had a fine day on Sunday. 4.) Chiefs linebacker Justin Houston is very fortunate to have escaped serious injury. A source told FOX Sports that Houston suffered a strained PCL ligament and a bone bruise but did not suffer any ACL damage and will not require surgery. Houston had 11 sacks this season and would’ve had more if he hadn’t missed five games because of an elbow injury. He’s part of the 2011 draft class that couldn’t cash in on their success until after their third season. In other words, Houston is looking for his payday soon. And thanks to the good medical news he received following an MRI on Sunday, he’s still in line to get one. 5.) Though it’s still early in the process for Greg Schiano, the former Tampa Bay Buccaneers coach has told some close friends he might sit out the upcoming season rather than chase the first gig he can find. 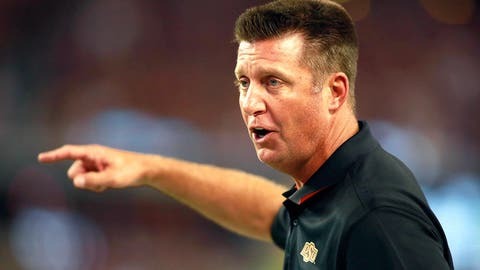 Given the fact he was fired after a tumultuous couple of seasons with the Bucs, it’s obvious that next job won’t be as a head coach on the NFL level. Schiano, who is still interested in coaching in the NFL, if possible, will have to do plenty of work to get himself back on the good side of NFL owners looking to hand over their franchise to a new coach. Perhaps one way to make that happen will be to work with his buddy Bill Belichick in New England as some kind of special assistant. It’s the Josh McDaniels route, and it’s working for McDaniels because he’s high on the Cleveland Browns’ list right now. Keep an eye on Schiano to see what tactic he winds up taking to resurrect his career.